These days all you have to do is google or visit your favorite food blog for a new recipe to try. However, there are weekend afternoons when I enjoy leafing through a cookbook much more than surfing the net. I recently obtained a copy of Southern Plate, a cookbook by Christy Jordan which focuses on classic comfort foods and southern foods that her family raised her on. I liked the fact that some of the recipes were easier to make and included shortcuts, for example, using ready-serve biscuit dough or chicken stock that I didn’t have to make first. There were so many delicious options, I have already made the potato salad and the fried green tomatoes. The recipe I am sharing with you now is a popular one, even the experienced bakers (who have their own recipe) have asked for this one. 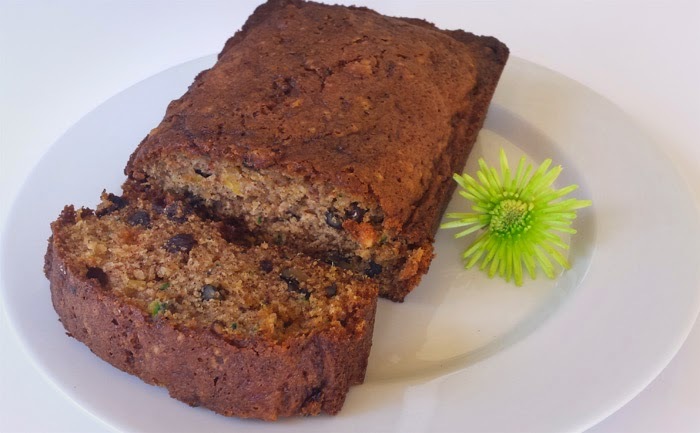 This zucchini bread stays moist for days, tastes delicious and the fruit and veggies make it healthy! Preheat the oven to 350 degrees and generously grease two 4x8 inch loaf pans or 4 to 6 mini loaf pans. In a large bowl, combine the eggs, oil, sugar, vanilla, zucchini, and pineapple. In a separate bowl, sift together the flour, baking soda, baking powder, salt, cinnamon, and nutmeg. Add the nuts and raisins and mix all together. Pour into the pans and bake for 1 hour for the full-size loaf pans or 30 minutes for the mini pans, or until the centers are no longer soft. I'm so glad zucchini season is coming! I'm ready for some of this yumminess! I love zucchini bread! I don't think I've ever tried it with pineapple.